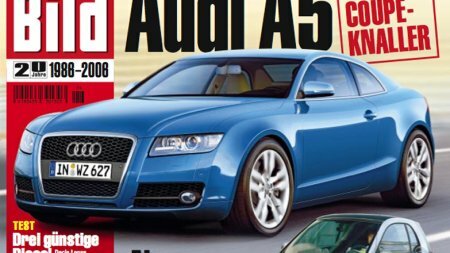 This is AutoBild’s artist’s impression of the upcoming Audi A5 due to be launched in 2008. The Audi A5 will be based on the Audi A4, and like it’s namesake will be positioned between the Audi A4 and the Audi A6. There seems to be some debates on whether it will be a competitor for the BMW 3-series Coupe or the BMW 6-series. Audi already has a larger coupe planned in it’s line-up, the Audi A7 which will be a four door coupe that goes against the Mercedes Benz CLS. While most artist’s impressions have shown a two door version of the Audi A5, there are some rumours that there will be a four door version as well.